To start the Worship Leader Podcast, click on on the link on the bottom of this web page and let me know what you think! So may the Lord bless each of you and I look forward to sharing all these podcasts and worship leader tips in the forthcoming weeks and months as well. And CLICK HERE for the full list of Podcasts, so you can listen to them all!!! Or click on on the player below to listen to the latest Worship Leader Podcast... This incredible worship leader podcast is about the Top 10 ways that you can improve yoursong and music arrangements. That's right, the podcast team track through their favourite ways of making worship extra special, and making it sound great. So if you are a novice, or even an experienced worship leader, you will get new and powerful ideas from this podcast that you can apply to your worship leading straight away! Also do not forget that we provide free e-books at our website. So if you're starting out and eager to learn some practical worship leader tips, between the worship leader pod and the free books you're sure to pick up info that will make you a greater worship leader, beginning next Sunday. And yes, we've got great instructing for everyone from worship directors and worship leaders to musicians, singers and even sound guys!!!! If you haven't got your free books yet, click the hyperlink below. And feel welcome to leave feedback or e-mail us because we want to enjoy the journey together with you. I'm sure that a lot of you will have worship leading tips that you would be able to share with others as well, so leaving comments on the weblog will likely be there for everyone to learn and be blessed. To start the Worship Leader Podcast, click on on the link at the bottom of this page and let me know what you think! So God bless you all and I look forward to your listening to these podcasts and worship leader tips in the forthcoming weeks and months as well. And CLICK HERE for the total listing of Podcasts, so you'll be able to listen to them all!!! Or click on on the player below to listen to the latest Worship Leader Podcast... This worship leader podcast is about how you can discipline your team while still keeping everybody happy! Not always an easy task, but we will all face this at some time. If you have human beings on your worship team, then this is a "must hear" podcast! Also remember that we offer free e-books at our website. So in case you are beginning and keen to learn some practical worship leader tips, between the worship leader podcast and the free ebooks you're certain to pick up information that can make you a better worship leader, starting next Sunday. And sure, we have now great teaching for everybody from worship directors, worship leaders to musicians, singers and even sound guys!!!! If you haven't got your free books yet, click the hyperlink below. And feel free to leave comments or e-mail us because we need to enjoy the journey together with you. I am sure that a lot of you've got worship leading tips you could share with others as well, so leaving comments on the blog might be there for everybody to read and be blessed. To begin the Worship Leader Podcast, click on the hyperlink on the backside of this web page and let me know what you assume! So God bless and I stay up for sharing all these podcasts and worship leader tips with you within the coming weeks and months as well. And CLICK HERE for the full list of Podcasts, so you possibly can listen to them all!!! Or click on the player beneath to hearken to the most recent Worship Leader Podcast... This worship leader podcast is about drummers... can't live with them, can't live without them. In fact, if anything in your team is going to be too loud, it is very often the drummer. However, as this podcast shows, there are great young drummers out there who care about their ministry and are sensitive and teachable. So if you have a drummer in your team, or are a drummer yourself, this is a "must hear" worship leader podcast! Also remember that we offer free e-books at our website. So if you are beginning and desperate to learn some practical worship leader tips, between the worship leader podcast and the free ebooks you are sure to pick up information that will make you a greater worship leader, starting next Sunday. And yes, now we have great teaching for everyone from worship directors, worship leaders to musicians, singers and even sound guys!!!! If you haven't bought your free books yet, click on the link below. And feel free to leave feedback or e-mail us because we want to enjoy the journey along with you. I am positive that a lot of you could have worship leading tips you can share with others as well, so leaving comments on the blog will likely be there for everyone to learn and be blessed. To start the Worship Leader Podcast, click on on the hyperlink at the bottom of this web page and let me know what you assume! So God bless and I look ahead to sharing all these podcasts and worship leader tips with you in the coming weeks and months as well. And CLICK HERE for the total list of Podcasts, so you may listen to all of them!!! Or click on the player beneath to listen to the most recent Worship Leader Podcast... This worship leading podcast is about one of the coolest things ever... singing harmonies. The pod takes you through the whys, wherefores and even teaches you super cool ideas and technique that will enable you to introduce killer harmonies into your worship team. So if you want to have 3, 4 or 5 part harmonies in your worship team, check out this weeks exciting worship leading podcast. Also remember that we offer free e-books at our website. So if you are starting out and eager to learn some practical worship leader tips, between the worship leader pod and the free books you are sure to pick up information that will make you a better worship leader, starting next Sunday. And yes, we have great teaching for everyone from worship directors, worship leaders to musicians, singers and even sound guys!!!! If you haven't got your free books yet, click the link below. And feel free to leave comments or e-mail us because we want to enjoy the journey together with you. I'm sure that many of you have worship leading tips that you can share with others as well, so leaving comments on the blog will be there for everyone to read and be blessed. To start the Worship Leading Podcast, click on the link at the bottom of this page and let me know what you think! So God bless and I look forward to sharing all these podcasts and worship leader tips with you in the coming weeks and months as well. Or click on the player below to listen to the latest Worship Leading Podcast... This worship leader podcast is about he power of praise and worship. Can you be healed in a worship time, or set free? Can praise and worship energize your church? Can the gang make any sense as they discuss these issues? These are the types of in depth, serious and slightly crazy analyses that you have come to expect for the worship leader podcast, and this episode does not disappoint! To start the Worship Leader Podcast, click on the link at the bottom of this page and let me know what you think! So God bless and I look forward to sharing all these podcasts and worship leader tips with you in the coming weeks and months as well. Or click on the player below to listen to the latest Worship Leader Podcast... This worship leader podcast touches something close to my heart... how to use worship leading correctly when doing evangelism! You can lead worship in church OK, but leading when you are outreaching is a completely different thing! Learn the secrets to real and powerful worship leading for outreaches in this important podcast, and learn the secret to helping the evangelist win souls for the Lord! Even if you are in a small church, this is essential listening for the health and future of your congregation, and one not to be missed. Or click on the player below to listen to the latest Worship Leader Podcast... This worship leader podcast proves it can be done... You can lead worship with one or even zero instruments to back you, and you can make it special and even stunningly awesome. If you serve the Lord in a small church this worship leader podcast will be of great, great value to you, because the team discuss how you can make the most of having little or no band members. So don't get discouraged if you serve in a smaller church, get motivated and get inspired because you may have opportunities that the others don't get. Oh, and Darin laughs so hard he actually loses the plot! Loads of fun, laughs and even sensible advice await you in this weeks worship leader podcast! Don’t get too emotional about it, but this worship leader podcast is about emotion inn your worship leading… the good, the bad and the ugly. If you have ever sat through an over the top emotional worship time, or a worship time completely devoid of any emotion, then you will gain real insight from this worship leader podcast. The panel discuss the right amount of emotion, and you will be moved to tears… or completely unemotional, depending on the type of person you are! Also do not forget that we provide free e-books at our website. So if you are starting out and eager to learn some practical worship leader tips, between the worship leader pod and the free books you are sure to pick up info that can make you a greater worship leader, starting next Sunday. And yes, we have great teaching for everyone from worship directors and worship leaders to musicians, singers and even sound guys!!!! If you have not got your free books yet, click the hyperlink below. And feel free to leave feedback or e-mail us because we need to enjoy the journey along with you. I’m sure that a lot of you may have worship leading tips that you may share with others as well, so leaving feedback on the weblog will probably be there for everybody to learn and be blessed. This incredible worship leader podcast is about the Top 10 ways that you can improve yoursong and music arrangements. That’s right, the podcast team track through their favourite ways of making worship extra special, and making it sound great. So if you are a novice, or even an experienced worship leader, you will get new and powerful ideas from this podcast that you can apply to your worship leading straight away! Also do not forget that we provide free e-books at our website. So if you’re starting out and eager to learn some practical worship leader tips, between the worship leader pod and the free books you’re sure to pick up info that will make you a greater worship leader, beginning next Sunday. And yes, we’ve got great instructing for everyone from worship directors and worship leaders to musicians, singers and even sound guys!!!! If you haven’t got your free books yet, click the hyperlink below. And feel welcome to leave feedback or e-mail us because we want to enjoy the journey together with you. I’m sure that a lot of you will have worship leading tips that you would be able to share with others as well, so leaving comments on the weblog will likely be there for everyone to learn and be blessed. And CLICK HERE for the total listing of Podcasts, so you’ll be able to listen to them all!!! Worship Leader Podcast 28: How to Discipline Your Team! This worship leader podcast is about how you can discipline your team while still keeping everybody happy! Not always an easy task, but we will all face this at some time. If you have human beings on your worship team, then this is a “must hear” podcast! Also remember that we offer free e-books at our website. So in case you are beginning and keen to learn some practical worship leader tips, between the worship leader podcast and the free ebooks you’re certain to pick up information that can make you a better worship leader, starting next Sunday. And sure, we have now great teaching for everybody from worship directors, worship leaders to musicians, singers and even sound guys!!!! If you haven’t got your free books yet, click the hyperlink below. And feel free to leave comments or e-mail us because we need to enjoy the journey together with you. I am sure that a lot of you’ve got worship leading tips you could share with others as well, so leaving comments on the blog might be there for everybody to read and be blessed. Worship Leader Podcast 27: How to Control Your Drummer! This worship leader podcast is about drummers… can’t live with them, can’t live without them. In fact, if anything in your team is going to be too loud, it is very often the drummer. However, as this podcast shows, there are great young drummers out there who care about their ministry and are sensitive and teachable. So if you have a drummer in your team, or are a drummer yourself, this is a “must hear” worship leader podcast! Also remember that we offer free e-books at our website. So if you are beginning and desperate to learn some practical worship leader tips, between the worship leader podcast and the free ebooks you are sure to pick up information that will make you a greater worship leader, starting next Sunday. And yes, now we have great teaching for everyone from worship directors, worship leaders to musicians, singers and even sound guys!!!! If you haven’t bought your free books yet, click on the link below. And feel free to leave feedback or e-mail us because we want to enjoy the journey along with you. I am positive that a lot of you could have worship leading tips you can share with others as well, so leaving comments on the blog will likely be there for everyone to learn and be blessed. This worship leading podcast is about one of the coolest things ever… singing harmonies. The pod takes you through the whys, wherefores and even teaches you super cool ideas and technique that will enable you to introduce killer harmonies into your worship team. So if you want to have 3, 4 or 5 part harmonies in your worship team, check out this weeks exciting worship leading podcast. Also remember that we offer free e-books at our website. So if you are starting out and eager to learn some practical worship leader tips, between the worship leader pod and the free books you are sure to pick up information that will make you a better worship leader, starting next Sunday. And yes, we have great teaching for everyone from worship directors, worship leaders to musicians, singers and even sound guys!!!! If you haven’t got your free books yet, click the link below. And feel free to leave comments or e-mail us because we want to enjoy the journey together with you. I’m sure that many of you have worship leading tips that you can share with others as well, so leaving comments on the blog will be there for everyone to read and be blessed. This worship leader podcast is about he power of praise and worship. Can you be healed in a worship time, or set free? 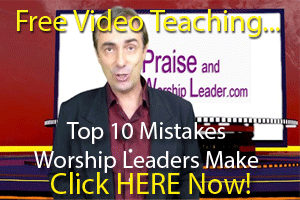 Can praise and worship energize your church? Can the gang make any sense as they discuss these issues? These are the types of in depth, serious and slightly crazy analyses that you have come to expect for the worship leader podcast, and this episode does not disappoint! This worship leader podcast is about your attitude to those who are on your team and better singers or musicians than you. It is tempting to be jealous, but God has a greater plan than this! If you have talented people on your team and feel a bit over awed at times, then this is an unmissable podcast which will show you how to handle situations, and make your team into a strong and mighty force for the Lord! So, if you want to be a worship leader of a great team, YOU MUST NOT MISS THIS PODCAST! This worship leader podcast is about having fun and actually enjoying your worship leading. So often we get bogged down in getting songs right that we forget to have fun, and this will eventually wear us down so we quit early. So, if you want to be a worship leader for a long time, and enjoy the whole journey, then this is one podcast YOU MUST NOT MISS! Oh, and did I mention that it was fun? Yeah, probably did that already, but truly, download it and check it out and have a giggle as you reinvigorate your worship leading! This worship leader podcast touches something close to my heart… how to use worship leading correctly when doing evangelism! You can lead worship in church OK, but leading when you are outreaching is a completely different thing! Learn the secrets to real and powerful worship leading for outreaches in this important podcast, and learn the secret to helping the evangelist win souls for the Lord! Even if you are in a small church, this is essential listening for the health and future of your congregation, and one not to be missed. Worship Leader Podcast 21: Worship Leading with Little or No Band! You can lead worship with one or even zero instruments to back you, and you can make it special and even stunningly awesome. If you serve the Lord in a small church this worship leader podcast will be of great, great value to you, because the team discuss how you can make the most of having little or no band members. So don’t get discouraged if you serve in a smaller church, get motivated and get inspired because you may have opportunities that the others don’t get. Oh, and Darin laughs so hard he actually loses the plot! Loads of fun, laughs and even sensible advice await you in this weeks worship leader podcast!